Ive seen stupid things in my time, but this almost takes the cake. 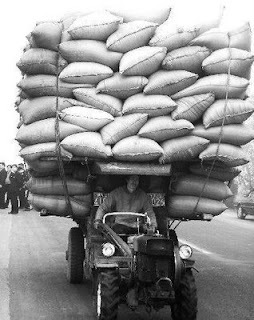 Im guessing they are bags of wheat or some sort of grain on top of this very mini tractor or quad bike. One wrong move and they will all come crashing down, probably on this guy's head. Worst job in the world?